Virginia is currently trialling several violas. When she has identified the instrument that is right for her, we will include the details on this page. London-born violist Virginia Slater began playing the viola at the age of six, when her older brother and sister decided to take up the violin. Her musical education took place at the Royal College of Music, Junior Department, the Purcell School with Ian Jewel and later at the Guildhall School of Music and Drama under the tutelage of David Takeno. As an established recitalist and chamber musician, Virginiaʼs UK appearances include performances in the Purcell Room and Queen Elizabeth Hall on Londonʼs South Bank, Wigmore Hall, St. Martin-in-the-Fields and the Royal Albert Hall as part of the BBC Prom Series. She has appeared at Festivals in Edinburgh, Brighton and the City of London and enjoys performing each Summer at the North York Moors Chamber Music Festival, where she has collaborated with musicians including Katya Apekisheva, Tamsin Waley-Cohen, Jamie Walton, Thomas Carroll, Mathew Barley and Rachel Kelly DʼAlba. On the international stage Virginia has appeared as recital and concerto soloist in Paris, Vienna, Budapest, Helsinki, Tallinn and Tokyo. Virginia also enjoys a varied and exciting freelance career. 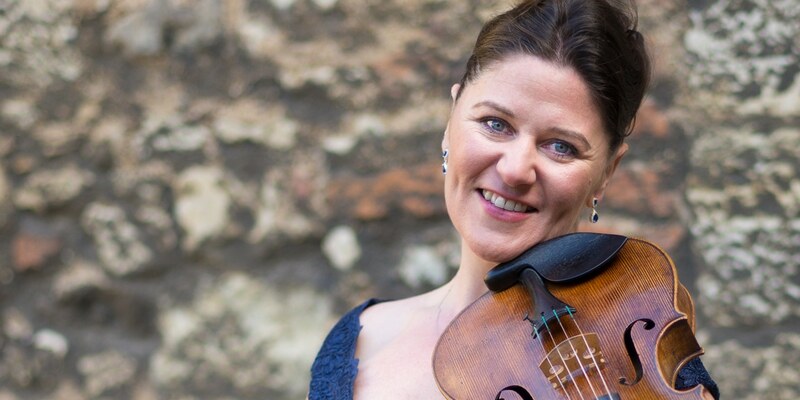 As a founding member of the Covent Garden Consort, she has made several recordings and has appeared in broadcasts on BBC Radio 3 and Classic FM. In demand as an orchestral musician, Virginia has performed as guest principal with Royal Liverpool Philharmonic Orchestra, Scottish Chamber Orchestra, Royal Philharmonic Concert Orchestra, Scottish Ballet, Opera North, Orchestra of the Swan and City of London Sinfonia. Virginia has been the grateful recipient of numerous prizes and trusts and has received appreciated awards from the Countess of Munster Trust, The Worshipful Company of Musicians, The Worshipful Company of Drapers and The Leverhulme Trust. 2018-19 promises to be an exciting time for Virginia. As the latest recruit of the esteemed Stradivari Trust she is looking forward to a European concert tour celebrating the purchase of the 1793 Mantegazza that she now plays. Forthcoming world premieres include a viola concerto by award winning composer Julian Philips, a set of solo sonatas by Golden Globe nominee Brian Byrne and a sonata for viola and piano by Freya Waley- Cohen as well as performances of Vaughn Williamsʼ Flos Campi for solo viola, orchestra and choir, Brittenʼs Lachrymae and Mozartʼs Sinfonia Concertante. In 2016 I was lucky enough to borrow this beautiful 1793 Mantegazza for the world première of a concerto by Julian Philips. Little did I know how I would struggle with the thought of parting with it. The instant connection I felt to this exceptional instrument was overwhelming, and continues to grow each day. It has a depth and sincerity to its tone, even in the higher register, that I have rarely heard in a viola, and it is a privilege to play. Its palette of colours, combined with its projection, is everything I have dreamed of in an instrument for so long. I am proud to have been a small part of this viola’s history and would love to be a part of its future.